Follow in the footsteps of Wagner's heroes like "Siegfried - The Killer of Dragons" on a mountain bike rather than a horse. How do carry your sword? We are not mountain bikers, preferring to use map reading and thinking to avoid hills. This trip is on offer by one of the bike shops in Lorsch, south of Frankfurt am Main. It should be possible to fly out on an early morning flight to Frankfurt International and followed by a train to Lorsch to reach there in time to join the group. You will experience the Odenwald, one of the German middle sized mountainous or hilly areas. From Lorsch in the Rhine Valley, you cross the Odenwald almost to the Bavarian border and back across the Neckar to Lorsch. 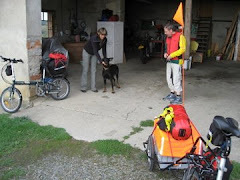 The bike shop organises the hotels, baggage transport, the sag waggon and offers technical support. The ice cream shops in Lorsch are something else. After your ice you can catch an evening flight back to Britain to go into work on Monday morning. The requirements:The trip is only really suitable for fit, technically competent mountain bikers, but you can cheat by using a MTB e-bike. The trip is four consecutive days with a total of about 230 km and 4,000 m. Bike hire is also a possibility.If you are interested drop the organisers an email under info(at)odenwaldbike(dot)de.